Sheep Thrills Farm: Thank You, Tina! My friend, Tina,has just nominated me for a Creative Thinking Blogspot Award for 2007! Who would have thought I would be instrumental in someone actually "thinking"??? One of the conditions of the award is to pass along five other blogspots that I feel makes me stop and take time to actually think about something. This condition alone made me think, as I have run across many blogs composed of pure fluff. Those are the blogs I only visit once. In actuality, when I stop to think about it, I never go back to those. --My daughter Kelly's blog always gets me to thinking - if it's not something new to ponder, it can even be wonderful (or painful) memories. --Tina's blog! 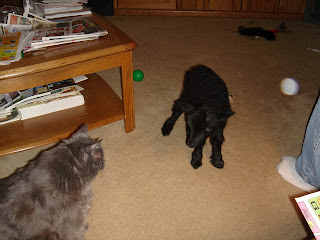 I just love reading about the coming and goings of the cats, Sinda and Neelix and the Vishus sheep that John, and now Shepherdess Tina, take care of. We've just got to get Tina spinning up all of those fleeces! --Leigh has a wonderful journal of not only her weaving, but her beautiful handspinning. Leigh is the one who inspired me to get back into weaving after a long hiatus. --Farmgirl is one of the most interesting accounts of farm life, or at the very least of a "city-folk-makes-good-in-the-country" blog. --Michelle's blog is a great one as well as Michelle asks intelligent questions that she can answer! And in the process makes one stop to think as well. So "Hats Off!" to all of these people for being as creative as they are. They are MY inspiration to continue this folly and see it through. And bless every one of you who takes the time to remind me: "We haven't seen a blog entry from you in a long time...."
Oh! Thank you, thank you, thank you. I am honored! Having already played along with this fun and though provoking meme, I'll just point to my previous choices here. That said, I can now fess up and tell you that you were one of my own top contenders, hee hee. I love your style of writing and your posts keep me coming back for more. Now on to visit your other choices! Thank you, Leigh! I didn't know that you had already received this award - only that you deserved to! And thank you for your daily inspiration!